For most of Terry Gilliam's early career, fans of the popular comedy show Monty Python's Flying Circus assumed that he was British, since Python's other five members were natives of Britain. But the innovative animator and future director, who spent more time behind the scenes than in front of the camera, was actually the troupe's only American member. Born in Minneapolis, Minnesota, on November 22, 1940, Gilliam was briefly employed by Mad Magazine as a writer/illustrator before he emigrated to England in 1967. Soon after he arrived in the U.K., he began working on Do Not Adjust Your Set, a popular children's TV show, developing his eccentric animated cartoons, which put into motion a hodgepodge of images, including photographs, cutouts from magazines, and famous works of art. Gilliam's contributions to the show were geared more toward adults, as his surrealistic stream-of-consciousness segments, drenched in black humor, were beyond the grasp of most children. Terrence Vance ‘Terry’ Gilliam was born in Medicine Lake, Minnesota in 1940. His family later moved to Panorama City in Los Angeles’ San Fernando Valley, when Gilliam was eleven. Gilliam attended the private Occidental College in Los Angeles, where studied physics, art history and political science. While still in his junior year, he became the editor of the college magazine ‘Fang’, in which he published humorous collages inspired by Harvey Kurtzman’s work in the seminal ‘Mad’ magazine. After graduating, he moved to New York, where he started working for Kurtzman on the satirical publication, ‘Help!’. The bulk of his creative work there consisted of fumetti – comic strips that used series of photos rather than drawings to illustrate a story, as if they were successive still scenes from a short film. Gilliam wrote the fumetti screenplays, drew storyboards, conducted castings and photographed whole projects, one of which notably starred an up-and-coming John Cleese. When ‘Help!’ magazine’s chronic underfunding finally forced the publication to close, Gilliam decided to go on a six-month trip around Europe, during which he made a living taking on occasional contracts, notably for René Goscinny and the Parisian magazine ‘Pilote’, among others. After his return to the United States, he worked as a book illustrator and copywriter, as well as artistic director for an advertising agency. In 1967 he moved to England, where he briefly worked for ‘The Sunday Time Magazine’ and ‘The Londoner’. Yet he continued to look for a change of direction. Fatefully, Gilliam contacted his former collaborator John Cleese, who put him in touch with the BBC. Gilliam soon began working with the creators of Do Not Adjust Your Set, a highly popular children’s programme, where met the members of Monty Python’s Flying Circus for the first time, setting the stage for years of future collaboration. He was also invited to collaborate on the comedy series We Have Ways of Making You Laugh and Marty Feldman’s eponymous Marty. It was during this period that Gilliam developed his signature animation technique, which allowed him to quickly produce inexpensive animations, using collages of art clippings complemented by his own illustrations. In October 1969, Monty Python’s Flying Circus debuted, starring John Cleese, Terry Jones, Michael Palin, Eric Idle, Terry Gilliam and Graham Chapman. In addition to producing the iconic animated sequences that served as loose narrative connections between sketches, Gilliam also contributed to the writing and set designs. 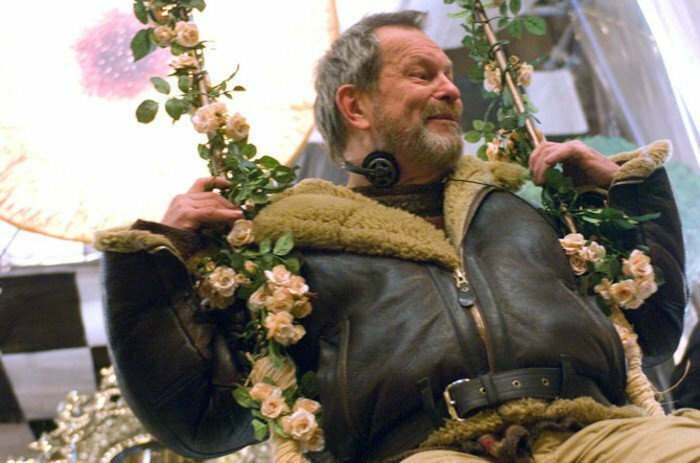 As the Flying Circus became a BBC mainstay, Gilliam also began to work on sound and occasionally played parts in sketches. Gilliam’s creative ambitions, however, soon outgrew short animations. In 1975, Gilliam and fellow Python, Terry Jones, co-directed the troupe’s first full-length film – Monty Python and the Holy Grail. In 1973, Gilliam married make-up artist Maggie Weston, with whom he has also worked on subsequent projects. In 1977 Gilliam filmed his first independent full-length project, Jabberwocky, which, to his dismay, critics viewed as a Monty Python creation. At the same time, while continuing to work with Monty Python, he began writing the screenplay for Brazil. Unable to finance the project at the time, Gilliam turned towards family film: the relatively low-budget Time Bandits was very successful in the United States and helped Gilliam to garner producers’ interest in the Brazil project. As the documentary The Battle of Brazil (1996) shows, the real difficulties started once production wrapped-up in 1985, marking the beginning of Gilliam’s infamous struggle with production managers and studios. After a poor opening in the United Kingdom, Universal Pictures demanded the film be cut, to which Gilliam would not agree. The film finally premiered in the United States after a year-long struggle. To this day, five different cuts of the film are available. Despite its struggles, Brazil is widely considered to be Gilliam’s most important film. The director’s subsequent project, the spectacular Adventures of Baron Munchausen, was also beset by difficulties, going significantly over budget because of production delays, legal problems and various unfavourable circumstances. The film’s budget overruns were widely reported in the press, which did nothing to temper Gilliam’s reputation as an unpredictable director driven by an outlandish imagination, which later hindered his efforts to bring other projects to fruition. The director decided it was time for a change. The Fisher King,shot in the Hollywood studio system, based on someone else’s screenplay and set in America, was a New York fairy tale that featured a star-studded cast and won Gilliam the Venice Film Festival’s Silver Lion, three nominations and two Golden Globe awards for its actors, as well as several Oscar nominations and the Oscar for Best Supporting Actress for Mercedes Ruehl. The subsequent science-fiction fantasy Twelve Monkeys was also nominated for two Oscars and received wide public acclaim. The two successful releases strengthened Gilliam’s standing in Hollywood. Soon afterwards, he received a proposal to direct Fear and Loathing in Las Vegas, an adaptation of Hunter S. Thompson celebrated 1971 novel. The film starred Johnny Depp and Benicio del Toro, who were already involved in the project before Gilliam came on board. Johnny Depp continued to collaborate with Gilliam on his long-planned The Man Who Killed Don Quixote. Unfortunately, the production collapsed in November 2000 under the weight of successive complications that, incidentally, were caught on camera along with the project’s eventual unravelling and edited into the fascinating documentary Lost in La Mancha. Undaunted, Gilliam moved on to other projects, filming The Brothers Grimm in Europe. Following yet more conflicts with producer Harvey Weinstein surrounding the film’s final version, Gilliam stopped working on the project for 6 months and went to the United States to film Tideland. Both films premiered in 2005. Tideland had a better critical reception than Brothers Grimm, but the films’ respective box office performances were inversed. Gilliam’s following project, The Imaginarium of Doctor Parnassus, was also beleaguered by various problems, the most important and dramatic of which was undoubtedly the untimely death of star actor Heath Ledger. Gilliam persisted with the project nonetheless, casting three other actors in Ledger’s role. The Imaginarium of Doctor Parnassus, the first film in which Gilliam made extensive use of computer animation, was nominated for numerous awards (including two Oscar nominations) for its sets, costumes and visual effects. Gilliam has made numerous memorable films. Yet almost equally impressive is the list of projects which (perhaps unsurprisingly) Gilliam has been unable to complete because of various difficulties, that have included lack of funds, actors’ schedules and assorted adversities, most evident on the failed The Man Who Killed Don Quixote; the inventory includes Time Bandits 2 and The Defective Detective (starring Nicolas Cage), based on screenplays by Charles McKeown and Richard LaGravenese respectively, as well as the screen adaptations Gormenghast byMervyn Peake, Watchmen (the graphic novel by Alan Moor and Dave Gibbon), The Hitchhiker's Guide to the Galaxy by Douglas Adams, Quasimodo byVictor Hugo (provisionally starring Gerard Depardieu), A Tale of Two Cities byCharles Dickens (which would have starred Mel Gibson, who opted for Braveheart) and the novel Good Omens byTerry Pratchett and Neil Gaiman. In 2010 Gilliam once again had to abandon attempts to film The Man Who Killed Don Quixote (this time starring Robert Duvall and Ewan McGregor in the leading roles), which he had been trying to revive since 2008. Gilliam has lately worked on various commissioned short films, but his most notable recent project is to direct The Damnation of Faust by Hector Berlioz at the English National Opera. Gilliam’s opera debut will premiere in May 2011.